It wasn't too long ago when me and my mates had a fantastic dinner at Skippy's Bar & Grill. The place is owned by a bloke named Steve Bird and his lovely wife Tina. We kangaroo hopped to this new place called The Forum, BGC and experienced Aussie comfort food like no other. It is a great place to watch sports games and there is even a 4 + 1 beer selection during happy hour. They have a massive selection of Australian beer here and that is something to not miss when visiting here. For cocktail lovers, they have a drink cocktail all you can promo with over 40 selections to choose from. This promo is only available every Sundays to Thursdays for only P379. Up first, the Chook Fingers (P150) was just the type of appetizer that got our appetites warmed up for the main courses. 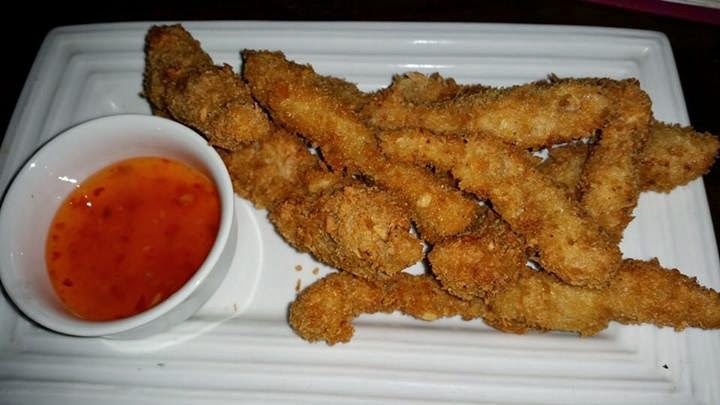 It is crunchy chicken fingers with sweet chili sauce that fit it perfectly. For people who work in the BGC area, you can try the Basic Breakfast (P165). Its got bread & butter, sunny side up eggs and a big frankfurter. It is enough to get you energized for work for the rest of the day. 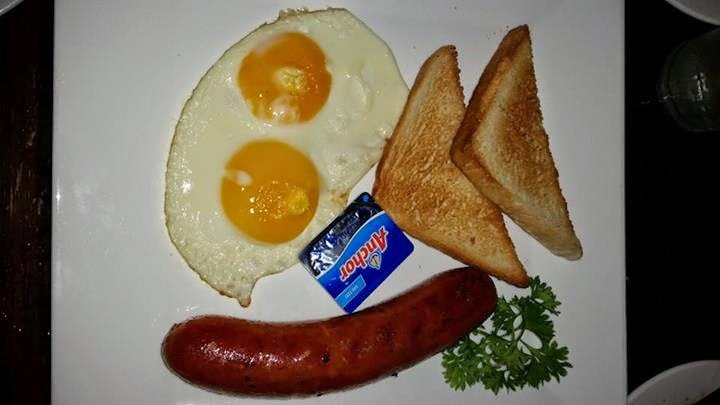 For those who want a heavy breakfast, why not go for the Big Breakfast (P350)? It is basically the basic breakfast added with baked beans, hash brown and bacon. 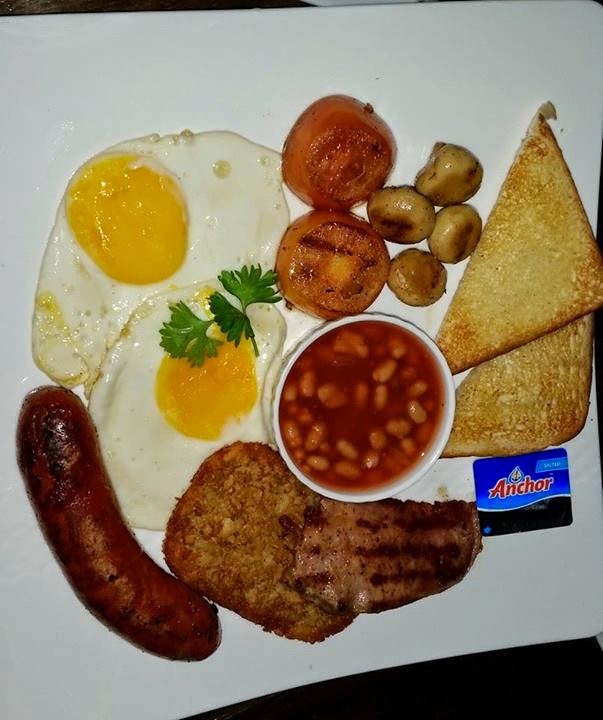 Its got all your breakfast favorites in one plate so I couldn't recommend this enough. 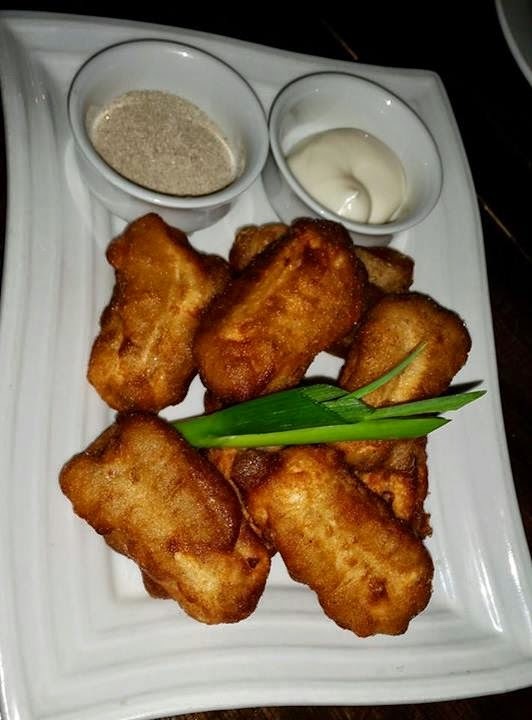 I can't believe I missed the Battered Dim Sims (P250). It ran out faster than I can say "I can climb Brokeback Mountain". The feedback from other bloggers were highly positive though and that is not a surprise. 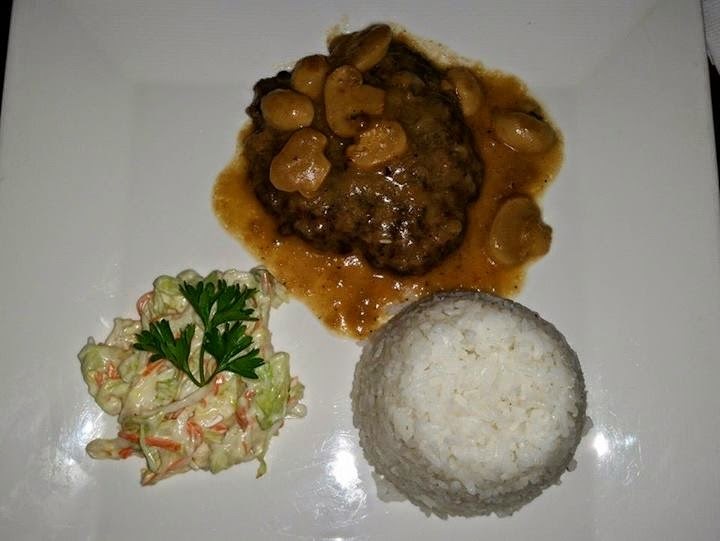 I was actually ecstatic to try their Salisbury Steak (P195) since I know for a fact that Australians make good steak. I have been to the land down under a decade ago and I know that's true. When I got to taste their steak, I was really impressed. The P195 promotional price is an offer you can't possibly ignore. 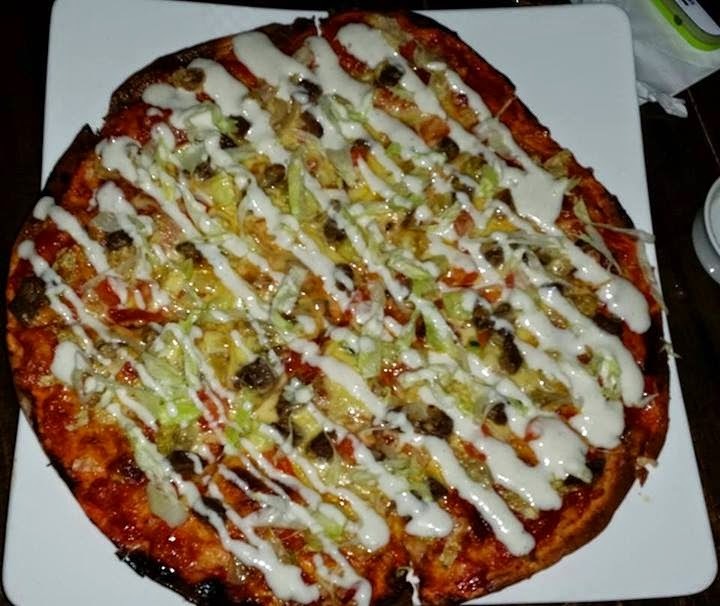 They were pretty original with the Shawarma Pizza (P450) as it literally had everything on it including grilled sirloin, cucumber, lettuce, yogurt, concase and onion. This is perfect to pair up with their imported Australian beer. 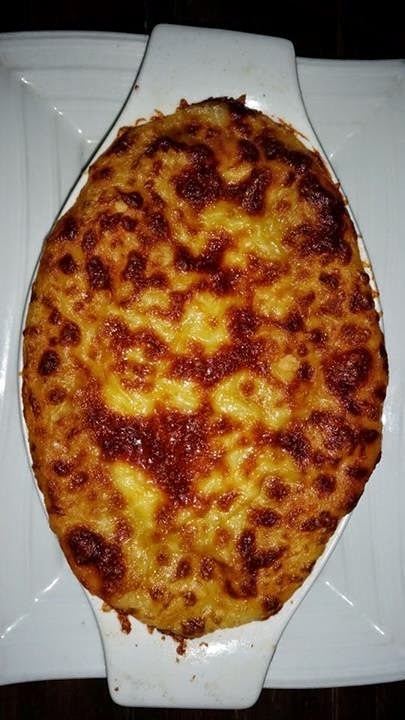 There is a theory that the Shepherd's Pie (P450) was made by granny fresh from the oven. Whatever the theory is, I could care less as all that matter is this baby is right in front of you because it is really a masterpiece. I have to give my hat off to Skippy's for this dish as it ruled. Nobody should ignore the fact that the Single Burger (P250) has 100% pure Angus ground beef. Their french fries is a bit underrated but I assure you would feel happy you tried it. 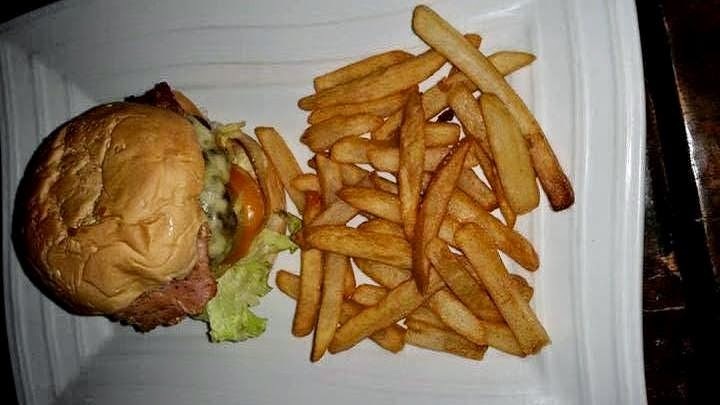 This burger sure is a keeper in all aspects. 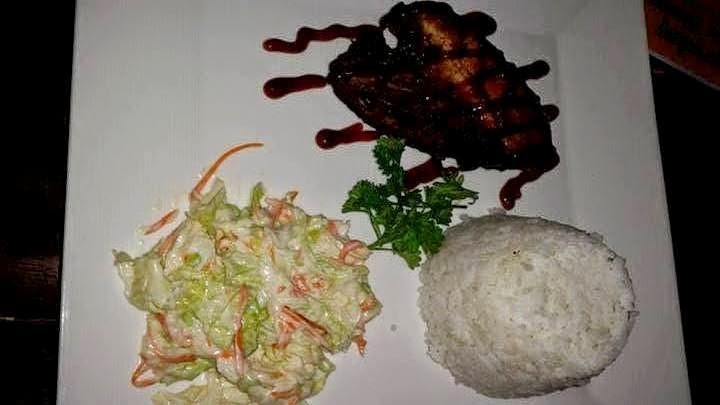 Another promotional meal to not miss is the Baby Back Ribs (P195). In fact, the meat here was so tender that it was too easy to divide it among us. I just wish they would sub the salad for something else like mac & cheese or french fries. The Chicken Parmigiana (P450) was my favorite dish for the night. The chicken breast was just too big which is good news to me. I really loved the way they combined the chicken, tomato sauce and cheese. 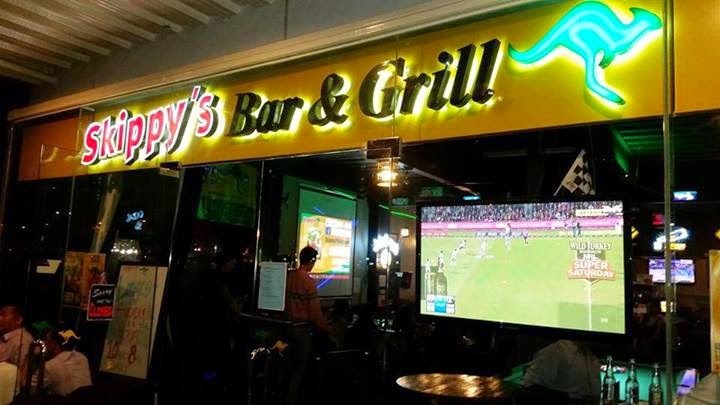 At Skippy's, there is a theme everyday as there is Beer Pong Mondays, Tuesday Acoustics (which is what we experienced), Corporate Wednesdays (10% off for corporate slaves), Spin-off Thursday featuring Skippy's house DJ, Rock-on Friday and local artists performing live every Saturdays. There are so many reasons to dine at Skippy's right now. Try their Aussie comfort food today! But wait, there's more! Enter the Rafflecopter giveaway below for a chance to win P1500 worth of Skippy's GC! It's very excellent promotion but lots of "work to do" first before finalizing it. That's the way Rafflecopter. Well, I remember I entered into this giveaway before. Thank you. wow!! i pass by this place a lot of times I didn't know that this place had great food. I want to try Sheperd's pie that's my favorite dish. I want to try the The Chicken Parmigiana because that looks so good. O am salivating right now. I want to devour that Shawarma pizza. Ikaw na naka S4! hahaha. I really like there Shepherd's Pie. 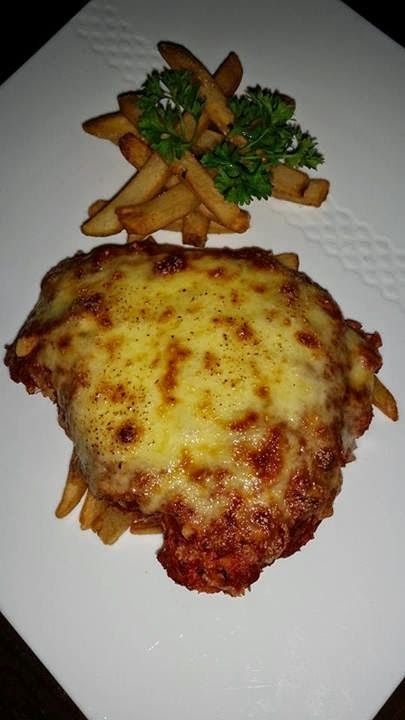 Love to try Chicken Parmigiana. Sounds good to me and hoping for a great taste! Finally, An Australian inspired restaurant. I'll try them when I go to BGC next time. Love to try most of the food you featured here but most especially the Salisbury Steak just to know if there is a difference between the much touted Australian steak from the rest. The Shawarma Pizza looks tasty! SHAWAWRMA PIZZA. It had everything on it including grilled sirloin, cucumber, lettuce, yogurt, concase and onion. I wanna try their Baby Back Ribs.. So love it!! I want to experience Chicken Parmigiana. I wanna try the Shepherd's Pie.. I love that egg and frankfurter. Who are the winners?